Interested in earning your degree? Apply now and we’ll waive the $75 application fee for all military-affiliated and veteran students. Finish your degree. Anytime. Anywhere. Prepare for a civilian career, advance your rank, or earn your degree while serving your country or using your GI Bill benefits. In addition to programs for active duty service members and veterans, the University is a participant in the GoArmyEd and Navy College programs. Thomas Edison State University provides two versions of the Financial Aid Shopping Sheet (FASS). The FASS is designed to help you estimate the cost of attending Thomas Edison State University during the current Academic Year, and identify potential sources of financial aid so you can easily compare Thomas Edison State University with other institutions and make an informed decision about where to attend school. This tool is provided as part of Thomas Edison State University’s commitment to the Principles of Excellence under Presidential Executive Order 13607. The first version of the Financial Aid Shopping Sheet is available to any prospective, applicant, or enrolled student. A second version is available to currently enrolled students via your Online Student Services account and will display detailed financial aid information if you have been awarded such. Want to learn more about our degrees for military students? 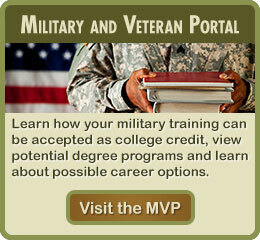 Contact Military and Veteran Education Support.